Precious metal scrap includes jewelry, watches, metal filings, silver tableware and decorative items, dental gold and silver, etc. To sell us precious metal scrap, you must represent a business whose activities have a logical link with the sale of its scrap metals. Examples of such businesses are jewelers, pawn shops, antique dealers, manufacturers, dental laboratories, etc. 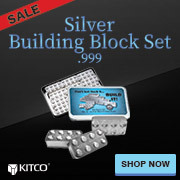 Private individuals cannot sell precious metal scrap to Kitco. I have called Kitco to establish my price. I agree with the relevant terms and conditions. To confirm a price for a sale of precious metal scrap, please call 1 877 775-4826.